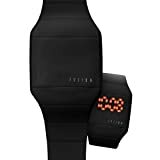 Dakota Watches – Fusion Black LED Wrist Watch Model: DK5124 Features black plastic one-piece case and band. Red animated hidden LED display. Purple plastic zip-up storage case.